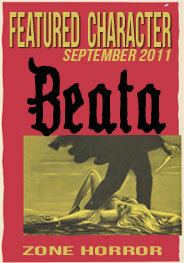 For Beata's role in The Midnight People, please see My Study. In her dreams, there is a garden. Dark, fragrant earth, rich as warmed wine, spills forth fruit and blossoms in wanton abundance. Life burgeons: hot, hungry, savage, insatiable. Alien vines grow thick and unchecked, heavy with succulent fruits; the warm, humid air leaves droplets of dew on shining leaves. The petals of night-blooming flowers unfurl slowly under the canopy of a twinkling sky. It is night in this paradise, perhaps eternal, though she is given only a glimpse of it. She wakes, terrified, panting, alone. Sometimes, she sees it every night. She thought that perhaps the convent walls, sprinkled vigilantly every day with holy water, might keep the nightmares at bay. But the mind creates its own hell; even on a day like this, an innocuous, cloudy day. She is in the herb garden, picking sprigs of thyme with the sisters. A rustle in the hedge; she turns around, no, doubt about it now, they peer at her through the verdant leaves. Fanged, toothed, clawed. They laugh, holding up, like a battle prize, a severed finger; a small, white one, with a neat little nail intact. The nub of her little finger aches, just at the base, where the lost digit had once been attached. She never listens, no matter how insistent, pleading, or mocking their voices grow. Would you like to retrieve it? Apr 07, 2012 10:58 am For a beautiful post filled with palpable magical details! Jan 25, 2012 10:50 am Beautiful description and characterisation.